Pitchers are always making tweaks and adjustments to their deliveries and repertoires in an effort to stay a step ahead of the hitters. In the case of Mets pitcher Jacob deGrom and Rays pitcher Blake Snell, the tweaks made those pitchers Cy Young worthy. DeGrom’s big adjustment came by suggestion from pitching coach Dave Eiland, who wanted the Mets pitchers to pitch inside more. For deGrom, this meant completely changing his approach to left-handed batters. DeGrom also upped how often he threw his fastball at the top of the strike zone (or above it) to them, bumping that from 58 percent of pitches to 67 percent. The inside fastballs backed hitters up off the plate. The high heat finished them off. Lefties hit .219/.267/.312 against him in 2018, his best numbers in a season against left-handed hitting. Combine that with even greater dominance against right-handed hitters and deGrom was at the top of his game for almost the entire season. DeGrom finished with the second-highest chase rate among pitchers with at least 100 innings pitched (38 percent). He ranked 10th in miss rate (29 percent). The pitcher who ranked first in miss rate was Rays pitcher Blake Snell (33 percent). Snell’s breakthrough season was a surprise. He posted ERAs of 3.54 and 4.04 in his first two seasons; you could not have seen his 1.89 ERA coming. What hitters apparently had trouble seeing was Snell’s curveball. He threw the pitch about 10 percent of the time in 2017, but netted misses on 51 percent of swings against it. In 2018, Snell’s strategy was to increase his curveball use, cutting back a little bit on his fastball and slider. He doubled his curveball usage to 20 percent of the time. 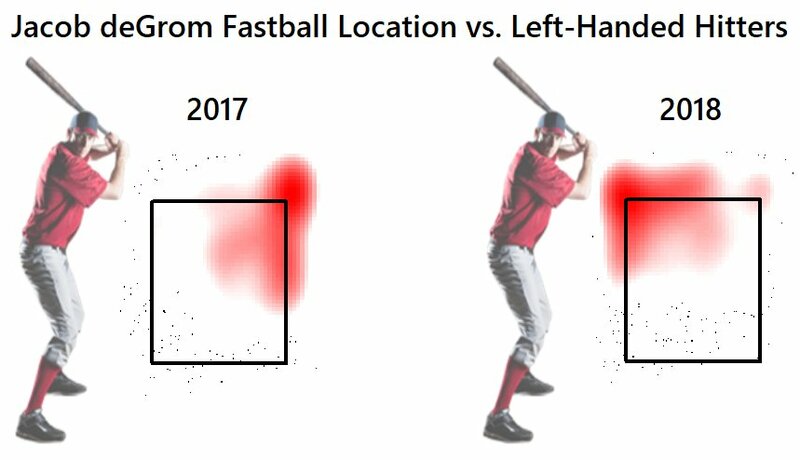 Hitters continued to miss the pitch on more than half of their swings. Paired with a 1.5 mile per hour increase in average fastball velocity to nearly 96 MPH, the Rays suddenly had something special. When Snell started on five days rest, those pitches were perfect. In 15 such starts, he pitched to a 1.08 ERA with a 4-to-1 K to BB rate. Three of Snell’s pitches – his fastball, curveball and slider – experienced major jumps in value per FanGraphs’ pitch data. He became a completely different pitcher, one whose performance was suddenly Cy Young worthy. Now he and deGrom have trophies to honor the successful changes they made.